I made this by accident. For Sa’s lunch I packed musubi and had leftover tuna that was sautéed in shoyu, sake, and sugar. On the counter was a very ripe avocado and suddenly I had the fixings for what I now call tuna avocado donburi. If you’re having a hard time imagining what this tastes like, think of a deconstructed California roll, sans the crab and sumeshi (vinegared rice). I usually buy the Trader Joe’s brand albacore tuna in water because it’s relatively inexpensive and the meat is nice and dense. Recently, we bought Chicken of the Sea, and though it’s cheaper, the meat was mush. For this recipe, you want to end up with a very dry and flaky tuna, and it took this brand a lot longer to cook the moisture off. I finished it off with shichimi, but next time pickled ginger would give it a more appropriate punch… oh, and some tobiko would be divine. Heat the oil over medium high heat. Fry the tuna in the pan for a couple of minutes until the moisture has evaporated. Add the shoyu, sugar, and sake and continue to cook until the liquid has cooked off and you’re left with dry, flaky tuna. 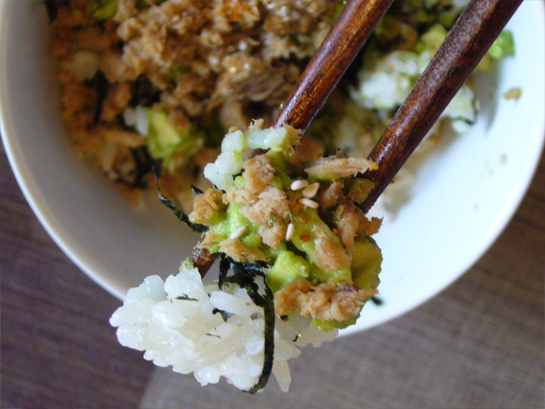 Assemble the donburi with hot rice on the bottom, then add nori, tuna, and avocado. Sprinkle with shichimi and serve. 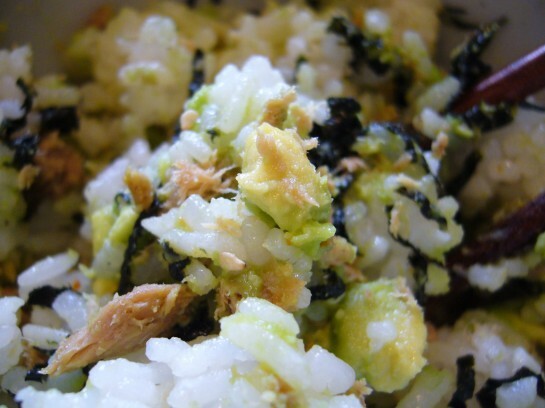 This entry was posted in Contemporary Recipes, Favorites, Fish, Rice Dishes and tagged avocado, Contemporary Recipes, donburi, recipe, Rice Dishes, tuna. Bookmark the permalink. Post a comment or leave a trackback: Trackback URL. I just made it. It’s delish! Thanks for inventing it and sharing! Thanks for the comment—I’m glad you liked it! That looks delicious, i love any dish that makes avocado the star of the show! I have half an avocado in the fridge and didn’t know what to do with it till now – thanks for the inspiration A!! This looks amazing! And you take beautiful food photos! I was looking at your picture and description at TasteSpotting and the first thing that came to mind was: deconstructed sushi! Then, of course, come to find out that’s how you describe it yourself. Still hankering for your somen (tsuru! tsuru!). Hopefully I will get to it tomorrow. Thanks for the comments—I hope you all get a chance to make this. A great way to stretch that dollar and have a tasty meal! J, thanks for all the encouragement in the planning stages of HB! Casey, thanks for your comments! Been trying to email you, but keeps bouncing back. Do you have another address I can reach you at? Leaving this comment so you have an alternate email address. I replied to your comment at tastestopping, but not sure that got through, if my email there is wonky. What a nice and simple and tasty looking donburi! Oh, this looks delicious, and tuna and avocado are some of my favorite things. We eat a lot of donburi around here so I think this is going on next week’s lunch menu for me (my husband doesn’t like tuna). I hacked together some cheap versions of these ingredients (starkist tuna, shredded seaweed of some unknown brand, etc.) and it turned out oh-my-god awesome. If my cheapy version of this turned out so tasty, I can only imagine how good it is when done properly. Becca, I’m glad you liked it! We’ve also tried adding chopped tomatoes and the tang worked quite well with the other flavors. Hope you experiment with it and try it again! This was so incredibly delicious. I’m not really a sushi fan, but this looked so good, so I took my chances and even bought the nori – and oh wow, this was so good. Thank you! Megan, thanks for the tip about using vinegar. I’ll have to try that next time! yummy! my husband and 2 year old loved it too (she’s a super picky eater), and it’s super filling, great quick meal! I’m waiting for my avocado to ripe…Can’t wait. So happy..I found your blog! I am enjoying it so much–Thank you! I made this recipe with the costco solid white albacore. I didn’t know what to expect in the beginning but the tuna flavor overpower the rest of the dish, which left a fishy aftertaste after each bite. I made sure the tuna was dried to flakes before serving and even with the kikkoman soy sauce and the sake it couldn’t drown out the fishiness of the tuna. Maybe you can improve on the recipe next time? Thank you for all your comments! I’m glad this recipe has been a hit for most people. It’s super easy, right?! Rob, I’m sorry you didn’t like the dish. Tuna has its own inherent flavor, so I wasn’t trying to mask its fishiness. Maybe try a different fish like salmon? Or, you can decrease the amount of fish in your donburi so that the rice and avocado are more pronounced. Just a suggestion! I’m still a fan!…I had the most amazing Katsu fish last week — with lime, amazing sauces, and an array vegetables that I would die for again …. — I’m finally convinced the Japanese Cooks/Chefs are the true “PALATE MASTERS” of the world! I’m having this for dinner with your pickled smashed cucumbers. The two dishes balance each other perfectly and are so delicious! Thank you for the recipes. Elena, glad to hear you’re combining a couple of recipes for a meal! Thanks for your feedback! Did you use a cooking sake? Is there anything I can substitute the sake with? Clarisa, I buy whatever sake is the cheapest when I use for cooking. Usually it’s the brand Ozeki or Gekkeikan. I’ve never done this but you can probably substitute with the Chinese cooking wine, Shaoxing. Hope it works! recipes on this blog rock! Patrice NYC, thank you so much! A go-to recipe for one of my favorite comfort foods! Thank you for posting this. Mmmm, sounds delicious, Leiah. I could use some sake, too…! Ah man I feel ya on the chicken of the sea. I bought it trying to be frugal but NEVER AGAIN. It was awful. Question. Is there something I can replace the sake with? Jordan, yes! A dry white wine would work.